Storey County Swimming pool located in Miners Park on Carson and F Streets. To the right of the pool is the Comstock RV Park. The "V" on the slope of Mt. 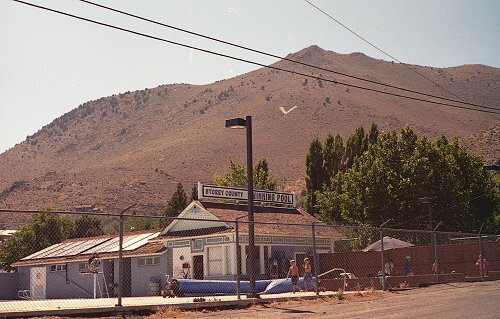 Davidson (also known as Sun Mountain) stands for "Virginia City." During the second and third decades of the twentieth century, similar markings were placed on hills near towns all over Nevada as navigation aids for U.S. mail planes, which dropped bundles as they flew over the towns. Visible in this picture only as a faint shimmer atop Mt. Davidson is the flagpole that Mark Twain mentions in chapter 55 of Roughing It. It is the original pole that was erected in 1862 but is seldom used because the powerful winds that buffet the peak will shred any flag left flying there for more than a few weeks. An American flag is traditionally flown on the mountain on the Fourth of July--the same date on which Mark Twain described seeing a flag on the mountain as he rode out of Virginia City. The summit of Mt. Davidson is 7,864 feet high (a figure you can remember by substituting a "7" for the "1" in 1864, the year Mark Twain left Virginia City). Vehicles can approach to within about 500 yards of the summit, but the remaining ascent is a steep hike up rocks. A memorial to the people who lost their lives in the terrorist attacks of September 11, 2001 was painted on a granite boulder near the flagpole, and an American flag was flown there during the month after that tragedy occurred. Mark Twain's remembrance of the flag in Roughing It notes that sunlight broke through the clouds to illuminate the flag at the very moment the Union was winning historic victories at Gettysburg and Vicksburg on July 7, 1864--another day on which record numbers of Americans were killed.